Proper auto body repairs of collision damage are critical to the safety and performance of your vehicle. Our state-of-the-art auto body and mechanic shop is equipped to repair all body damages, glass, air bag replacement and collision related-mechanical repairs. Our Computerized Estimating System and Digital Imaging electronically speed up the claims process. Repairs are monitored and negotiations are made with insurance companies as the repairs progress. Zoel's Body And Auto Center has highly trained I-CAR and ASE certified automotive technicians, earning an "I-CAR Gold" and "Blue Shield ASE" status for our facility. 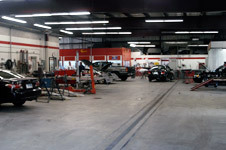 Our standards are high whether the auto repair is large or small. We use high hi-tech equipment, and quality parts and materials. Computerized Frame Ailgnment equipment: "Chief EZ Liner S21" and "Auto Robot XLSII" to return vehicles to pre-accident condition. The "Gensis II," is a sophisticated measuring system for unibody and frame measurement, critical for our technicians to restore your vehicle to manufacturer's specifications.